The category positively correlates with the data speed. I.E. the higher the category, the higher the possible frequency and the higher the frequency, the higher the possible data rate. Customers often ask about data cable categories and what they mean. For many end-users, engineers and purchasing agents, who don’t work with these types of cables on a daily basis, the different categories can seem complicated and overwhelming. However, what appears to be complex at first glance, can be simple to understand with a couple of tips. One can compare category cables to a multi-lane road; the more lanes a road has, the more vehicles that are able to travel on this road concurrently. The standards are generally based on a maximum cable length of 328 ft. This cable length consists of 295 ft. of installation cable and 33 ft. of patch cable. After the initial 328 ft. a repeater/extender is added to the cable system, which strengthens the signal and prepares it to be transmitted an additional 328 ft. as needed to connect the machine or its apparatus, and the control unit. Additionally, category data cables have to fulfill decoupling values of the pairs, e.g., near end cross talk (NEXT). For Cat 5 cables, the decoupling of the pairs is realized in the cable construction with different twisting lengths of each pair. That means for four pairs, you have four individual twisting lengths during production. The effectiveness of the twisting is not able to reach the target values and you have to add in additional steps during cable construction for higher categories. Cat 6 cables allow you to choose between two technical designs. The relevant decoupling values of Cat 6 can be achieved with a plastic cross that creates distance between the pairs. Another way is to use a pair in metal foil (PIMF) construction. The thickness of the aluminum foil influences the effectiveness of the shield. Many people think that a shield in the construction protects the cable from environmental influences. However, it also has the opposite effect—the shield keeps the electrical signal in the cable and avoids negatively influencing other equipment in the vicinity. For even higher categories, such as Cat 7, 7e, and 7A, a copper braid is mandatory to fulfill the standardized electrical values because an aluminum foil alone is not enough. Furthermore, each shielding material has advantages and disadvantages. Aluminum foil is inexpensive, but by itself this material does not perform well in applications that require flexible, track, or torsion cables. If you move a metal foil again and again you start to see cracks, which decreases the effectiveness of the shielding in the cable. This is the reason why some manufacturers construct cables that move frequently or are located in electromagnetic vulnerable (EMV) areas using both an aluminum foil shield and a copper braid. This applies to even to cables that are “only” Cat 5 classification. For cables with high amounts of bending cycles and small bending radii, some manufacturers use an additional metalized tape to fulfill effective shielding. This is similar to a woven tape with integrated metalized parts, which offers longer lifespan without cracking compared to a standard aluminum foil. Let’s now turn to a variety of possible conductor options, from both a material and stranding perspective. In most applications, bare copper is the preferred conductor material to use. However, in specific applications, such as the railway industry, a tinned copper conductor is preferred due to its higher corrosion resistance. In terms of conductor stranding, solid conductors are typically used in fixed installations, while flexible applications require a more nimble conductor which typically consists of seven strands. Flexible conductors are used for cable tracks and robotic applications with short lay length in order to achieve a more flexible cable and smaller bending radius. For the smallest bend radii and maximum cycle quantity/service life, customers can request to have data cables constructed with 19-strand conductors. The more strands in a conductor increases its flexibility; however, the best solution for a customer’s specific application and respective technical specifications should be discussed in consultation with the cable manufacturer. Once the construction of the conductor has been defined, it’s time for the next production steps: insulation extrusion, twisting of the individual conductors into pairs (or four conductors known as a star quad), shielding, and lastly, the outer jacket. • Conductors with long lay lengths for fixed cable installations, and short lay lengths for flexible and high-flex applications. • Aluminum foil shield for fixed installation, because the aluminum cracks after a few cycles, thereby decreasing the shield quality. When aluminum foil is used as a shield in flexible applications, it’s always in combination with a copper braid, and the aluminum foil is incorporated into the shielding process. • Braided shields with long lay length for fixed installations, but short lay length for flexible and continuous flex applications. Cable jacket types are plentiful and can be narrowed down to what application the cable will be performing in. For cable installations in buildings polyvinyl chloride (PVC) or flame retardant non-corrosive (FRNC) compounds are the typical choice of jacket material. PVC is not halogen free, but it’s flexible and inexpensive. FRNC compounds meet the requirements of halogen-free and flame retardant, and emit a less optically dense smoke, which makes exiting a building easier and allows for improved firefighting operations in the event of a fire emergency. Polyethylene (PE) jackets are mainly used for outdoor cable applications and/or in cases where a cable needs to be buried into the ground. These cable jackets are good at resisting moisture and exposure to the sun. 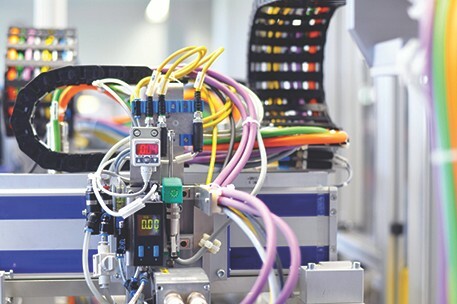 Due to the increase of data cables being used in industrial automation, it’s common to use oil-resistant PVC blends, polyurethane (PUR) or thermoplastic elastomer (TPE) jacket compounds. These cable jacket types are preferred for their increased oil resistance, and ability to withstand the mechanical stresses often associated with the use of cable tracks/drag chains, and robotics. The choice of a particular compound or blend is based on the application and operating conditions. Finally, it is highly recommended to have data cables that have had their mechanical capabilities extensively tested to withstand the rigors of operating in continuous-flex (cable tracks) and torsion (robotics) applications. Data transmission rates can lessen or signal quality could erode due to cables that are unable to withstand strenuous operating conditions. Manufacturers should use a combination of test equipment, such as cable tracks, torsion apparatuses, ovens and freezers, and, in some cases, specific application testing rigs, such as towers that mimic the strain and load on cables found inside wind turbines.